Wilmington, NC: On May 19-20, travel industry partners in Wilmington, North Carolina and the island beaches of Carolina Beach, Kure Beach, and Wrightsville Beach will welcome the 25th Annual Seaside Soccer Classic, a youth soccer tournament sanctioned by the NC Youth Soccer Association. Hosted by the Wilmington Hammerheads Youth FC, the Seaside Soccer Classic provides a fun, safe, and competitive opportunity for teams of all levels. The goal of the event is to provide players, from ages 9 to 19 years old, a competitive end-of-season tournament in a community that offers the families a beautiful weekend surrounded by sun, sand, and the Wilmington Riverwalk. According to Wilmington Hammerheads Youth FC Tournament Director Dani Pittman, this year’s tournament will host 275 teams from North Carolina, South Carolina, and Virginia. Each team consists of an average of 15 players. All but 40 local teams will travel from out of town. Each of the 4,125 players is expected to be accompanied by multiple family members. Additionally, 300 coaches and 175 referees are expected to accompany the teams. During the two-day tournament, the majority of the participants and their families will stay at a variety of hotels and shop, dine and play in local establishments. Sponsors include Jimmy John’s Gourmet Sandwiches, Traveling Teams, Jeff Gordon Chevrolet, Wilmington KOA, and N.C. Youth Soccer Association. This year’s Seaside Soccer Classic will take place at several soccer fields in New Hanover County, including: Cape Fear Regional Soccer Park, Hugh MacRae Athletic Park/Roland Grise, Veterans Park, Eaton Fields/Ogden Park, and Northern Regional Park. For details the 25th Annual Seaside Soccer Classic, visit WilmingtonHammerheadsYouth.com, or email dani@wilmingtonhammerheadsyouth.com. 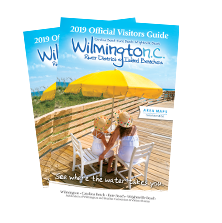 To download a free Official Visitors Guide to Wilmington NC’s river district and the beaches of Carolina Beach, Kure Beach, and Wrightsville Beach, visit WilmingtonAndBeaches.com.